THE unique festival of Nordic and Scottish music, song and dance, Northern Streams, heads north from its Edinburgh base to Dundee for a sneak preview concert celebrating its 16th year later this month. Caolmhar – Hannah Sundkvist (fiddle, mandolin, voice), Kristian Hodén(accordion), Mattias Walla (viola, fiddle) and Mattias Hammarsten (guitar) associated with V-Dala Spelmanslag – recognised as Sweden’s longest-running student folk ensemble and three-times student world champions, perform a range of Nordic and Scottish music and songs. Adult tickets only £5 (child £2), which also gets you the opportunity to look around the Unicorn as well. Please note numbers are limited, so booking essential! Booking information is in a separate link on the tickets page on www.northernstreams.org. For more details of the Northern Streams programme visit www.northernstreams.org or email: eltmsa@yahoo.co.uk or tel: 0795 191 8366, or Facebook – TMSAEdinburgh&Lothians and Twitter @northernstream1. Northern Streams is organised by the Traditional Music and Song Association (TMSA) Edinburgh & Lothians branch. Details about the branch at: www.eltmsa.org.uk and TMSA – www.tmsa.org.uk. We acknowledge support from the Tórshavnar Kommuna, from individual donations, Torshavn Kommunar, Bilda plus the Edinburgh Old Town Development Trust (EOTDT) and City of Edinburgh Council Southside/Newington Community Grants & Local Events fund. Publicity photos of all the performers are available electronically at the media page on northernstreams.org – please tel: 07951 918366 (Fiona) or email: eltmsa@yahoo.co.uk for any queries e.g. if you require any recordings. Described as “…something out of the ordinary” by The Herald, throughout the years Northern Streams has showcased performers often new to Scottish audiences, offering opportunities to learn about different cultures around the North Sea through a mix of concerts and workshops. The Pleasance is a student union complex run by Edinburgh University Student Association (EUSA). Its recent refurbishment has opened up spaces that are a great fit for the Northern Streams Festival and we are pleased to be returning to one of our original venues. A café/bar is available at the venue plus plenty of other options available locally. Caolmhar is a Swedish quartet that interprets and performs traditional Scottish and Nordic music. The group performs the music with a mix of tradition, effects and improvisation to create an unique sound. Their name comes from an appearance in a 19th century poem, which seems to be a misprint of ‘ceolmhar’ which means ‘musical’ rather than the possible other option of meaning ‘cheesy’! 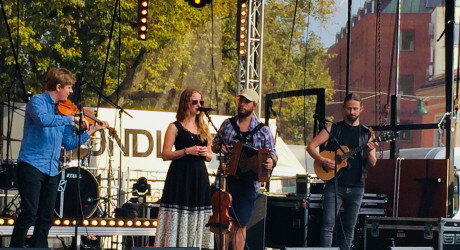 Hannah Sundkvist (fiddle, mandolin and voice) is the leader of the folk-band, ‘V-dala Spelmanslag’, who performed at the Northern Streams Festival in 2018. It is considered the world’s oldest student folk music orchestra, founded in 1961. Kristian Hodén (accordion) – another member of ‘V-dala Spelmanslag’ and has spent quite a bit of time in Scotland as a student learning Scottish music from the source. Mattias Walla (viola and fiddle) – also a member of ‘V-dala Spelmanslag’. At Northern Streams, we are looking forward to hearing their mix of repertoire from around the North Sea as well as being able to teach Swedish dances, songs and tunes. MEDIA RELEASE issued by TMSA. You too can share your stories (aka press or media releases), on this site. Email here for more information. Check out too twitter.com/allMusicPR, twitter.com/allFestivalsPR, twitter.com/allEdinburghPR and twitter.com/allDundeePR.